On another Thursday (April 3, 2014), we’re again at Raglan Road Pub in Downtown Disney. 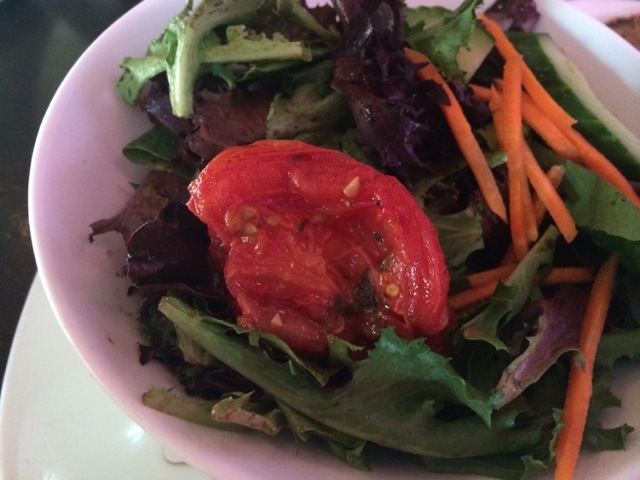 In a departure from recent visits, I went with the mixed green salad instead of the caesar salad (Nick got a caesar salad again, he knows what he likes). The dressing was lightly done (yay). 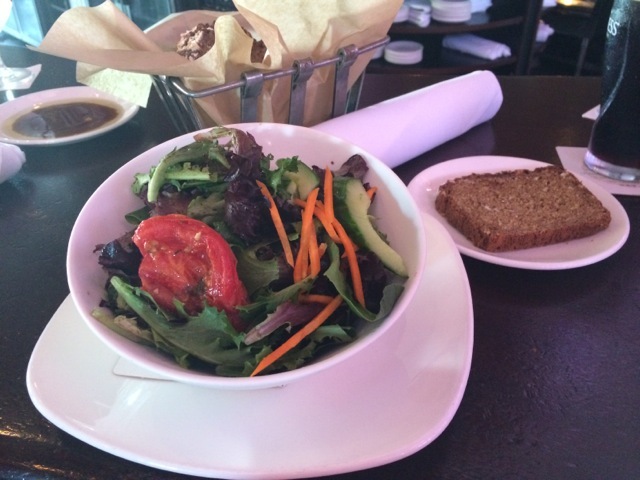 We both are huge fans of how the salads at Raglan Road Pub are lightly dressed (I guess we’ve said that before, but it bears repeating… too often, salads are just drowned in dressing which really negates the “healthy” aspects of eating a salad!). I particularly liked the roasted (some would say blistered) tomato. It was sweet and savory, very flavorful. I could eat a whole bowl of these as a side vegetable; especially if you added some cucumber and blue cheese crumbles. This was very good and it may become my go-to salad. Nick really loves the caesar salad at Raglan Road Pub, it’s just the right size and very tasty. 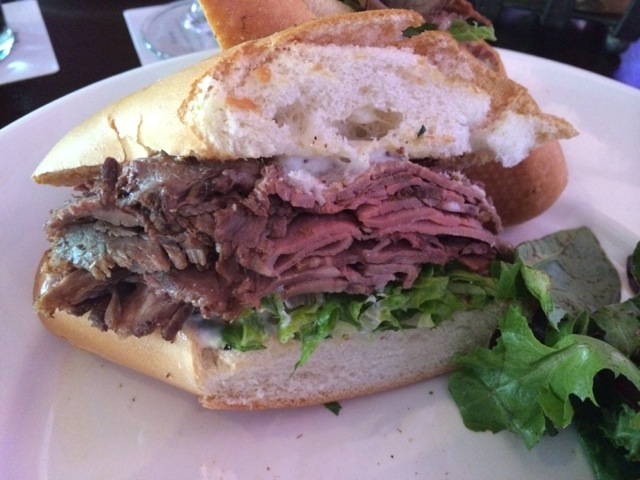 There isn’t a full description of the sandwich online… Let’s see what I can remember… Sunday’s Roast Beef, lettuce, and horseradish mayo. This was a good sandwich, in our never to be humble opinion… it needed some mustard. This sandwich requires a large mouth to eat it! In other words, it’s tall. It really reminded me of my Mama Louise’s leftover roast beef sandwiches. It had the same tastes and textures (minus the mustard and a slice of tomato). The beef was dried and more well-done than I expected. This wasn’t bad but we thought it could have been much better with more horseradish mayo or mustard. 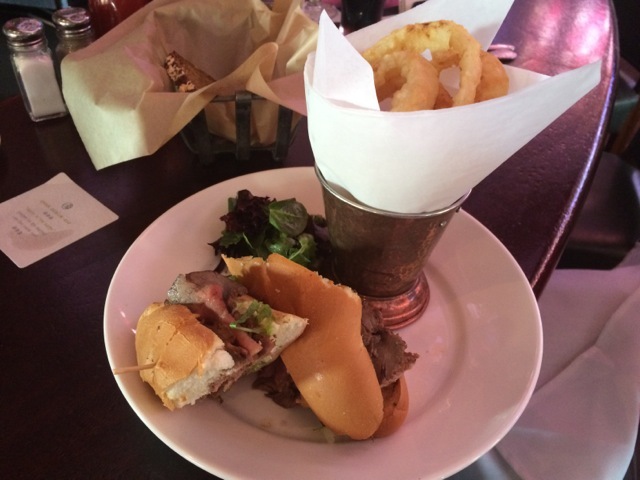 We think that this is the first time that we’ve ordered onion rings at Raglan Road Pub – now Sarah at Gluten Free & Dairy Free at Walt Disney World raves on and on about the onion rings (they make them special for GFDF people)… so we decided to give them a try! These were very good! There was a deft hand at the battering. They were crisp, not oily. The onions were sweet and tender. 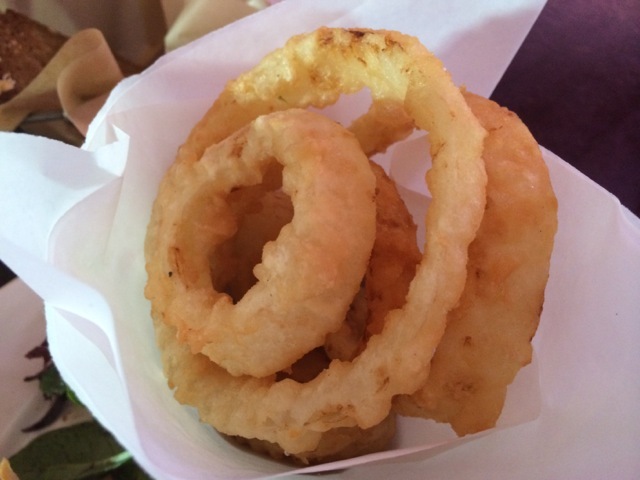 Overall, very good onion rings… but of course, we should have expected them to be since Raglan Road does a good job with their fried foods (better than most places at Disney World and better than most places outside of Disney World).